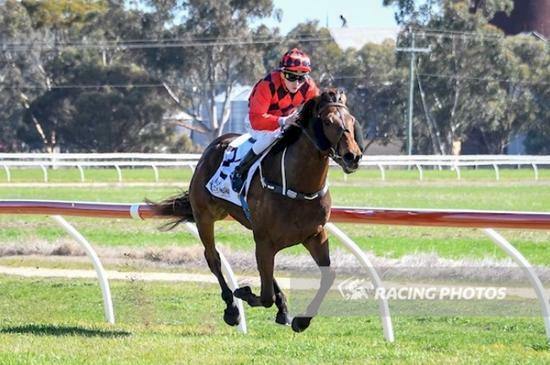 Aptly named Wanted galloper “Break And Enter” was able to bring up two wins in as many starts after an eight week let up, when he took out the first race at Warracknabeal today the 1800m BM 58. Given a great ride by claiming apprentice Justin Huxtable, he had drawn slightly awkwardly in barrier 10 to be able to take up his customary front running position. Justin was able to get him across without using him up too much too early and took the initiative to try a different tactic and had him settled 6th in the running about 5 lengths off the leader. He made his move at about the 600m mark coming out wider on the track off the heels of the race favourite on the turn to break away from his rivals and hit the line eased down to claim the race by almost 4 lengths. Congratulations to all of his connections, it was great to get another win on the board with Probie who looks to be in for a very successful preparation.